I was pleasantly surprised to find out that the Houston area has a thriving craft brew industry, including St. Arnold, Karbach, Buffalo Bayou Brewing, and a number of others. The No Label Brewing Company in Katy operates out of one the old rice mills that I wrote about in my previous post. I have not yet had the pleasure of sampling their wares but I intend to at first opportunity. 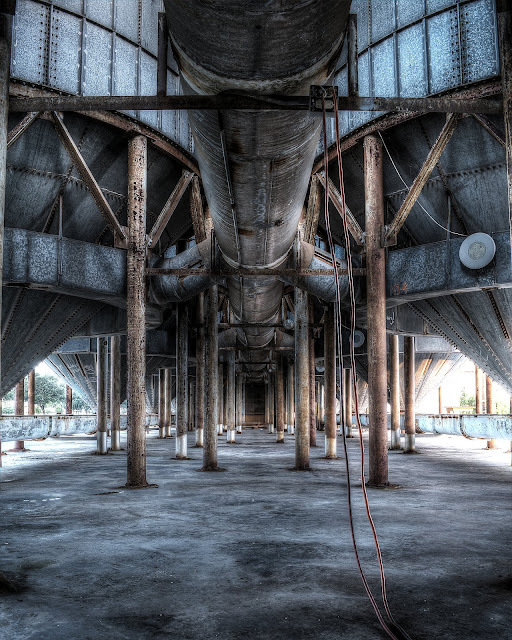 This photo is from under the inoperative rice silos of the No Label Brewing mill. At the end of the way is the building housing the actual brewery. BTW, the new photo on the masthead is awesome. Geiger-ish -- that's exactly what Switbo said. I'll take it! This is a really sweet pic. Thanks Jerry, that means a lot from you! I've been following the photography posts on your blog and learning a lot!